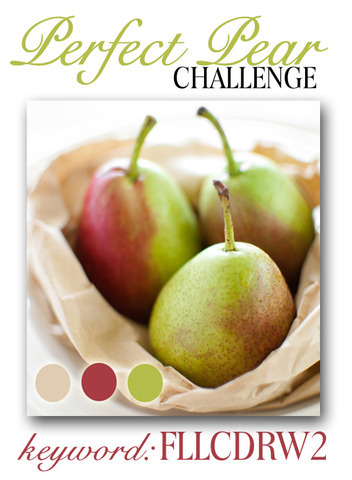 Flourishes is having a challenge "The Perfect Pear" and I'm hoping to win the entire December release. The stamps I've seen so far are gorgeous. I'll have my name in the draw twice because I also used a Flourishes stamp (Moments in Time #SS160). See Inspiration Image below. I kept the card simple since we can't combine challenges - sigh!! 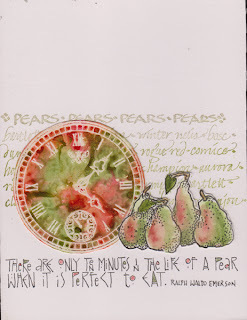 I stamped the clock on glossy paper with Perfect Medium and clear embossed, then used Distress Stains (Peeled Paint, Barn Door and a touch of Rusty Hinge), sprayed with Perfect Pearls "Perfect Pearls" mist and dried, then cut out. The pears (Impression Obsession) I stamped with Versafine Black Onyx, cut out and painted with watercolors. The background stamp (Stamp in the Hand "Words Pears") I inked with Distress pads (Pumice Stone on the upper words and Peeled Paint on the lower words) and stamped across the white cardstock card. I wrote in the quote using a Micron pen in my funky monoline and colored a few of the letters with colored pencils. Love the background you created for the clock. Oh, how beautiful! Love, love, LOVE this card, Yogi! The white space sets off those lovely and perfectly blended colors very nicely. As always, you've done wonderful work with the Moments in Time stamp. Oh I love how pretty this looks! The clock is fantastic with the great colors! Great creation! You ROCKED this challenge, Yogi! LOVE what you did with the stains on the clock face... the colors are beautiful, and the pears are wonderful, too! Thanks for playing! I honestly wish I had your talent with color. This is so beautiful and yummy at the same time! !